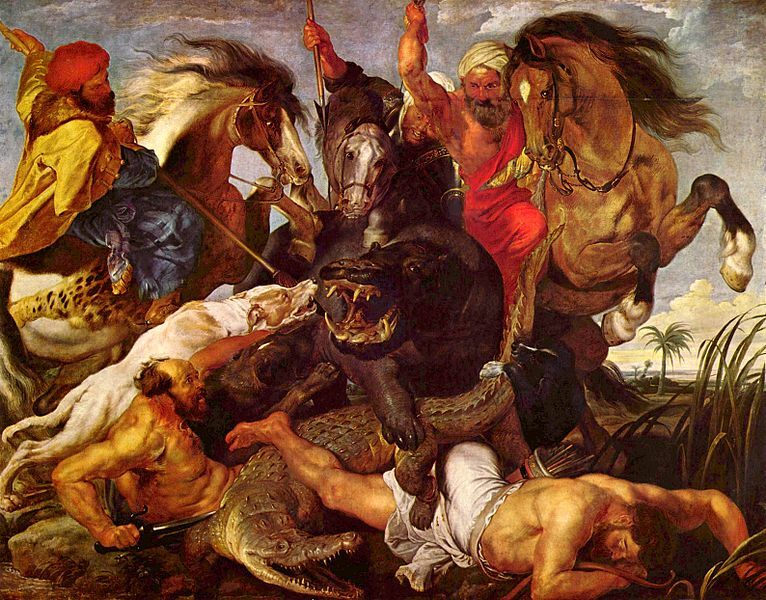 Flemish painter Peter Paul Rubens was born 28th June 1577. Rubens was a major seventeenth century artist And was a proponent of extravagant Baroque style that emphasised movement, colour, and sensuality, who was known for his Counter Reformation altarpieces, portraits, landscapes, and history paintingso mythological and allegorial sujects.In addition to running a lare studio in Antwerp that produced paintings popular with nobility and art collectors throughout Europe, Rubens was a classically educatd humanist scholar and diplomat who was knighted by both Philip IV, King of Spain, andChares I, King of England was raised as a Catholic. Religion figured prominently in much of his work and Rubens later became one of the leading voices of the Catholic Counter-Reformation style of painting (he had said “My passion comes from the heavens, no from earthly musings”). In Antwerp, Rubens received ahumanist education, studying Latin and classical literature. By fourteen he began his artistic apprenticeship with Tobias Verhaeght. Subsequently, he studied under two of the city’s leading painters of the time the late Mannerist artists Adam van Noort and Otto van een.Much of his earliest training involved copying earlier artists’ wrks, such as woodcuts by Hans Holbein the Younger and Marcantonio Raimondi’s engravings after Raphael. Rubens completed his education in 1598, at which time he entered the Guild of S. Luke as an independent master. Sadly Rubens died from heart failure, which was a result of his chronic gout on 30 May 1640. He was interred in Saint Jacob’s church, Antwerp. The artist had eight children, three with Isabella and five with Hélène; his youngest child was born eight months after his death.Rubens was a prolific artist. His commissioned works were mostly religious subjects, “history” paintings, which included mythological subjects, and hunt scenes. He painted portraits, especially of friends, and self-portraits, and in later life painted several landscapes. Rubens designed tapestries and prints, as well as his own house. He also oversaw theephemeral decorations of the Joyous Entry into Antwerp by the Cardinal-Infante Ferdinand in 1635.His drawings are mostly extremely forceful but not detailed; he also made great use of oil sketches as preparatory studies. He was one of the last major artists to make consistent use of wooden panels as a support medium, even for very large works, but he used canvas as well, especially when the work needed to be sent a long distance. For altarpieces he sometimes painted on slate to reduce reflection problems.His fondness of painting full-figured women gave rise to the terms ‘Rubensian’ or ‘Rubenesque’ for plus-sized women.Rubens was a great admirer of Leonardo da Vinci’s work. Using an engraving done 50 years after Leonardo started his project on the Battle of Anghiari, Rubens did a masterly drawing of the Battle which is now in the Louvre in Paris. More of Rubens valuable paintings have also recently been discovered in Oxford.